Our KERN platform is the essence of mountain biking. They will give you a real pedDling efficiency in climbs and will give you pleasure and adrenaline on the descent whether in 120 (KERN SL), 140 (KERN) or 160 (KERN LT). The Kern platform has been developed in the field with the help of our Enduro drivers through the various races of the Enduro World Series. Based on our LR / VR kinematics, it is for us the very essence of mountain biking: climbing efficiency, speed and safety on descent. The Kern are available in three strokes: Kern LT for the Enduro in 160mm, Kern for the All Mountain in 140mm and Kern SL for the Trail in 120mm. Strength (inset 1): 6069 is the most difficult alloy to break and with the best fatigue strength. Alloy 6069 offers the best density/elasticity ratio. – by reducing the effect of torque when pedalling for better efficiency of the rear wheel. The tapered shape of the head tube allows for a stiffer front triangle, meaning a more-precise ride. A 100% integrated design that uses the edges from our E.T. concept. Lateral opening for a clearer view of SAG. We recommend the use of a shock absorber under the weight of the pilot (SAG) of 35%, so 15mm for the KERN SL, 20mm for the KERN and 22mm for the KERN LT. In order to meet the expectations of the most demanding of riders, we have developed a new HM Toray® T800 carbon chain stay. The monobloc manufacturing associated with our specific lay-up contributes greater rigidity necessary for large bermed corners and swift accelerations. In collaboration with Antidote Solutions engineering consultants, we’ve developed new kinematics for our KERN range, based around 2 concepts: V.R. (Virtual Rotation) and L.R. (Leverage Ratio). V.R. / Virtual Rotation: a kinematic principle of virtual pivot points. The curve of the pivot points moves back along the length of the frame as travel increases, which is ideal for suspension balance. At the start of travel, the front pivot points make it easier to sit into the slope and avoid ‘catapult’ effect when hitting jumps. Progressive : to maintain stability throughout the travel range and to avoid bottoming out. Parabolic: to quickly lower the ratio around SAG and thereby get better support from the suspension. The relationship between suspension and SAG is important in order to avoid stability problems. 0 to 60 mm : High ratios (between 2.9 and 2.6) provide comfortable and relatively soft suspension. 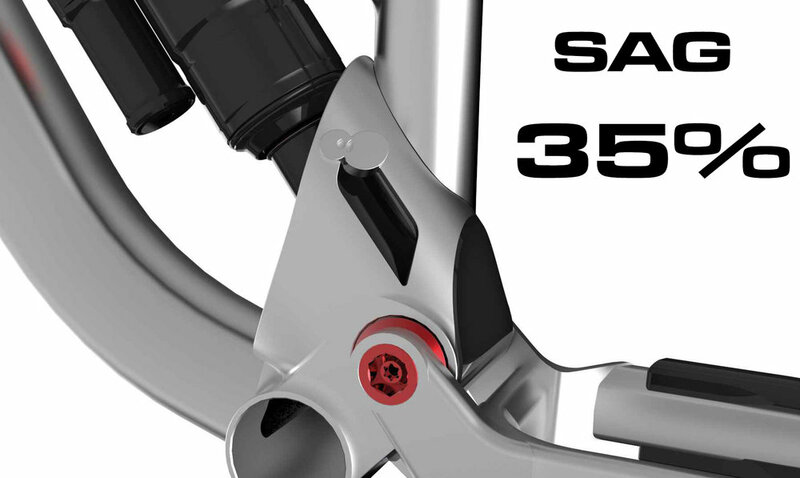 The progressive shape makes it easy to reach the SAG value (a ratio of around 2.65) and facilitates negative travel, which is important for the bike to move smoothly over broken ground. 60 to 120 mm : (ratios between 2.6 and 2.4) the curve is still progressive, but ratio reduction is slowed; suspension is firmer and gives better grip. 120 to 160mm : (ratios between 2.4 and 2.38) the curve bottoms out at 150 mm travel (2.37). 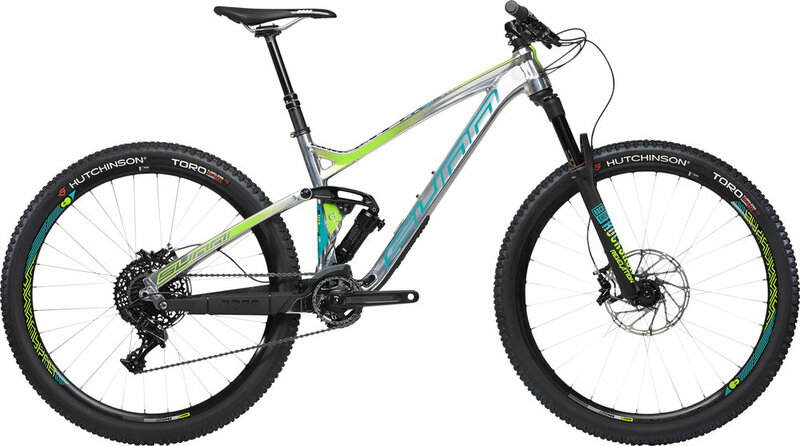 The progressive shift in ratios from 2.9 to 2.37 stops the shock bottoming out at the end of travel. At the very end of travel, the force exerted on a pneumatic spring (air shock) increases quicker than the travel (Ramping), which means maximum travel is never reached. This is why, to compensate for the ultra stiffness of the air shock, we’ve slightly lifted the curve again at the end of travel (from 2.37 to 2.40).